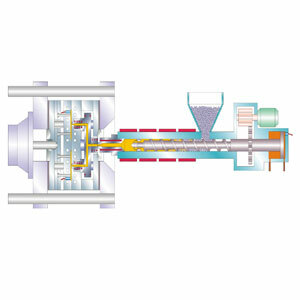 The hydraulic accumulator has the function to save energy, because during a cycle of injection molding there are times when the pump and not requested, and how the oil can not be compressed, but rather the gas, allowing it to accumulate energy, providing that you work with pumps lower arterial runoff, maintaining the efficiency (speed), which would require a number much larger pumps. 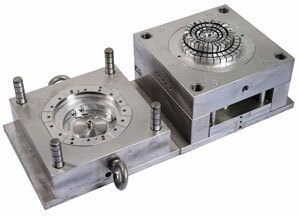 The accumulator is designed to boost the injection forward motion to aid in the filling process of thin walled parts. Not necessarily large parts but very thin walls. The hydraulic accumulator is to keep a constant supply of oil and pressure on the cylinders as they move forward. As the cylinders move the volume displaced is temporarily greater than the smaller diameter supply piping can replace with a standard pump. The hydraulic accumulator has a stored volume that rapidly responds to fill that void until the pump regenerates. Therefore you get a more consistent material flow which improves melt flow through the gates at a constant rate, especially on multiple cavities thus eliminating potential gate freeze. People who design parts have to work with many materials besides plastics and many processes besides injection molding. They need some understanding of all these but can't be expected to be the complete expert in any one of them. That's why we should not work in closed rooms. The plastic parts designer has to start the thing off but eventually it has to become a collaboration with the rest of the supply chain. In the meantime there is some help for the designer in the shape of design guides, design for manufacturing techniques, and injection molding design rules embedded in some CAD systems. The part wall thickness should be as uniform as possible. Transitions from thick to thin areas should be gradual to prevent flow problems, back fills, and gas traps. 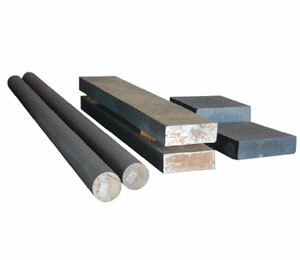 Thick sections should be cored out to minimize shrinkage and reduce part weight and cycle time. Radius / fillet all sharp corners to promote flow and minimize no-fill areas. Deep unventable blind pockets or ribs should be avoided. Avoid thin walls that cannot be blown off the cores by air-assist ejection. Long draws with minimum draft may affect ease of ejection. 1) Being relatively short glass fibre reinforced, the fiber tends to align itself in direction of flow. The level of orientation of the glass depends on fibre length vs section thickness and on turbulence in the flow of the material. Both factors need to be considered when analyzing this. Mold flow often misses the turbulence thing and maybe the level of orientation thing. The change in shrinkage due to orientation is extreme and can cause severe warpage depending on plastic part geometry and gate position. 2) PBT is semi crystalline. The number and nature of more or less crystalline areas is somewhat dependent on hold pressure and additive packages and even color, ut is very dependent on rate of cooling and rate of transition from liquid to solid and on second order transitions. Plastic part and injection mold geometry can have a strong influence on this and frankly detailed analysis takes a first hand look at drawings, injection mold and plastic parts and a real knowledge of the characteristics of the material. Hot runner is a set of temperature control heating-device, installed in the plastic injection mold, it is part of the mold. A Hot Runner System is used to maintain a molten flow of plastic from the injection molding machine nozzle to the gate in a plastic injection mold. 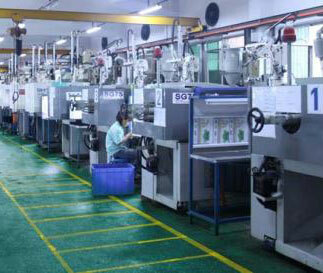 The system is generally composed of three parts, the sprue bush, the manifold block and one or more hot nozzles. The system can also include valve gates which are a method of physically shutting the gate off, giving a better cosmetic appearance and allowing larger gates to be used. Surface roughness, dimensional accuracy of plastic parts and injection mold life heavily rely on the surface hardness and wear resistance of mold steel. Therefore, plastic injection molding surface of the mold requires sufficient hardness, the hardness after quenching should be not less than 55 H RC. During plastic injection molding process, the mold plates stand hundreds of thousands of clamping pressure, especially big-sized and complicated structure injection molds, the mold steel used must have high strength and good toughness to performance well. 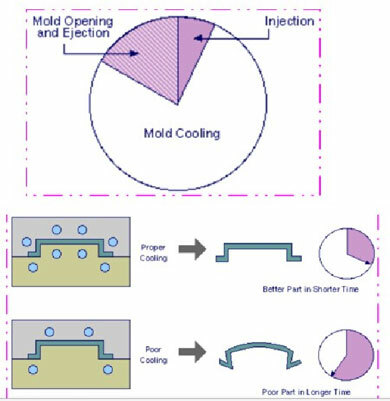 I would like to share an old story about injection mold venting. Years back mold makers kept a Perfume Atomizer on their bench. This was the old style with a rubber bulb that you squeezed. It however was filled with Kerosene. Prior to adding venting channels to a new injection mold, the mold maker (at the press) would squirt the atomized Kerosene in the cavity area just prior to closure and subsequent shot. When the mold opened for inspection it showed the burn marks at each spot where the last fill spots resulted in "Dieseling", thus identifying the best placement for adding vents. Today we have the software that will identify flow patterns and point out the ideal vent positions. However, once a flow front passes a vent it becomes useless and I can't count the times that I have had issues with molds that had vents in the wrong place. This is why I always insist on running a "Short Shot" series of parts to validate the flow pattern and vent locations. I make it a point to keep these Short Shots stored for reference should any issues with that mold show up at a later date, sometimes minor mold revisions change the flow pattern and the venting efficiency.